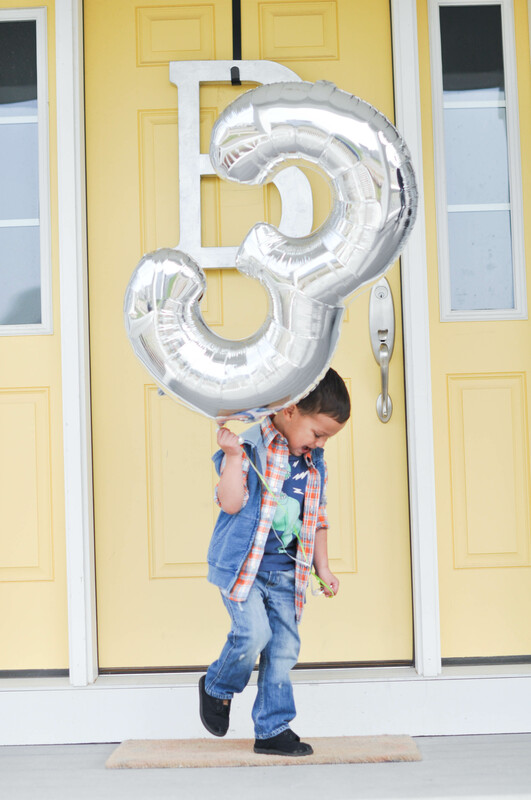 I was more than eight months pregnant with our second son when it was time for our child’s third birthday party. 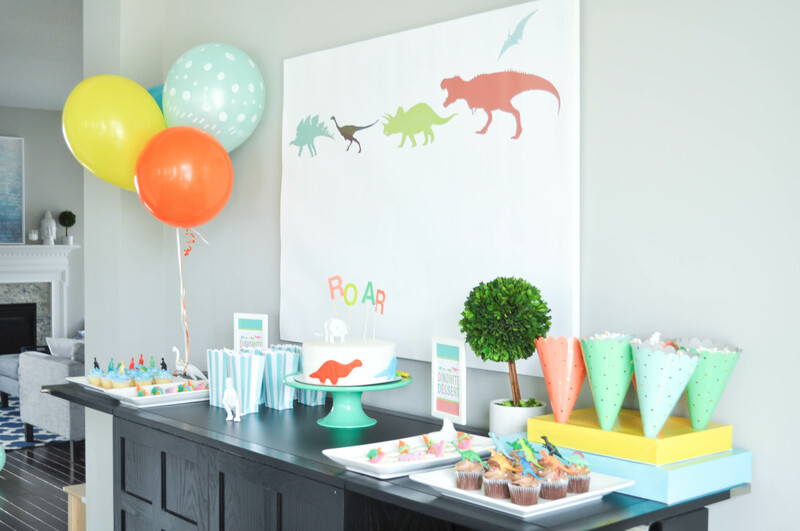 Being pregnant and knowing that birthdays are really all about the birthday boy (or girl), I skipped making anything myself and went almost completely store-bought for this fun, bright, and colorful dinosaur 3rd birthday party. It was a hard shift, but it made life easier. 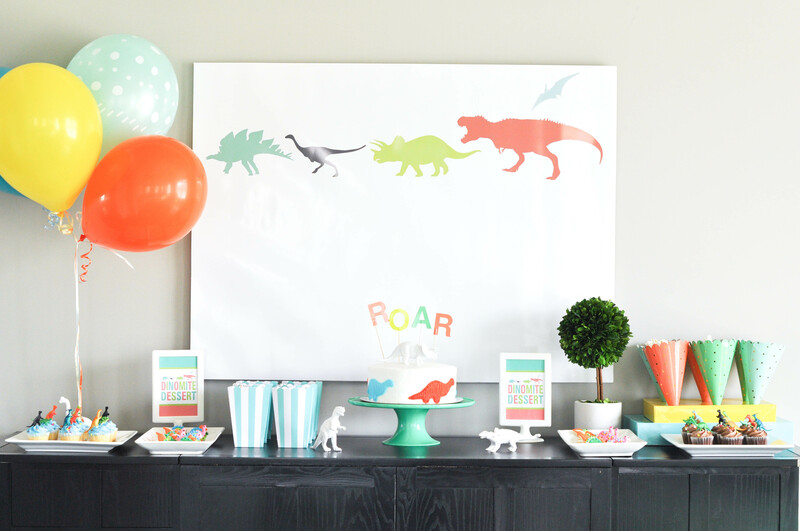 This year my party inspiration was simply to keep it simple. And my son loved it. With a bright color palette, I went with an “anything goes” attitude around colors. I pretty much used every color under the sun with a focus on bright! 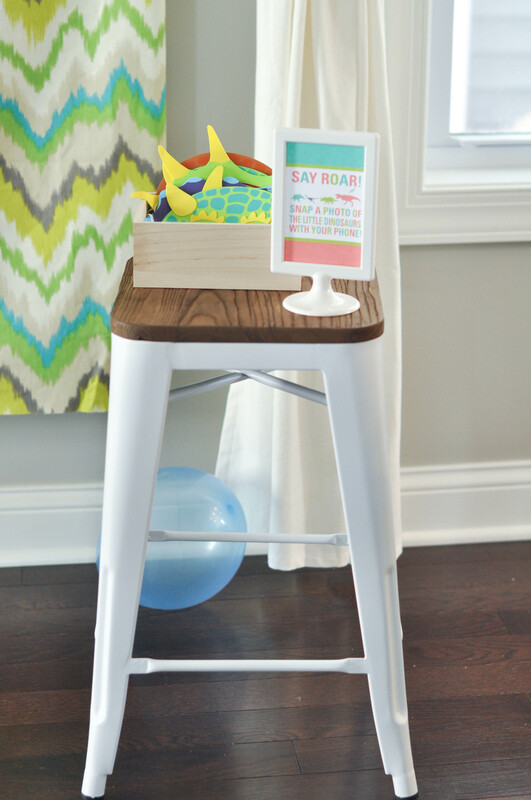 The dessert table looked much less polished than in past years, but it had all of the fun elements kids care about. Cupcakes, tiny cookies, cake pop dinosaur eggs, popcorn, and, of course, birthday cake filled the table and all of the tiny bellies. Store-bought cupcakes that Bodhi picked out (blue frosting, anyone?) were topped with small dinosaurs that I ordered from Amazon. Our son’s birthday cake was store-bought from Target. 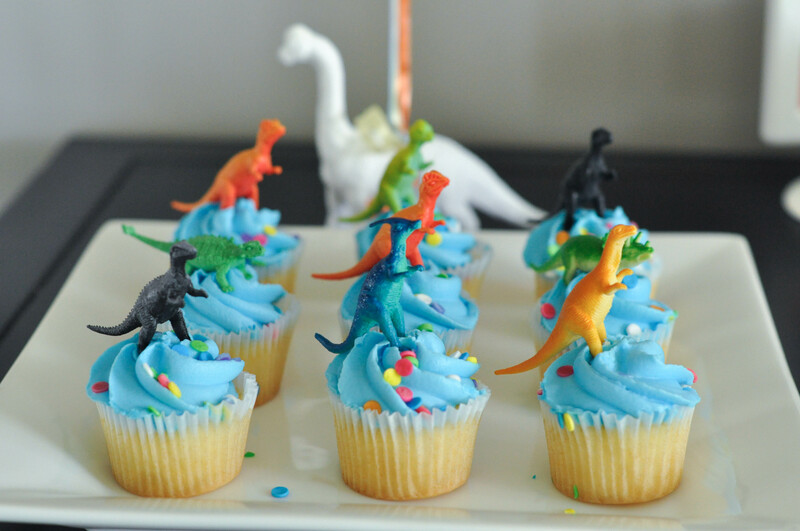 They just added a few frosting dinosaurs on the side. 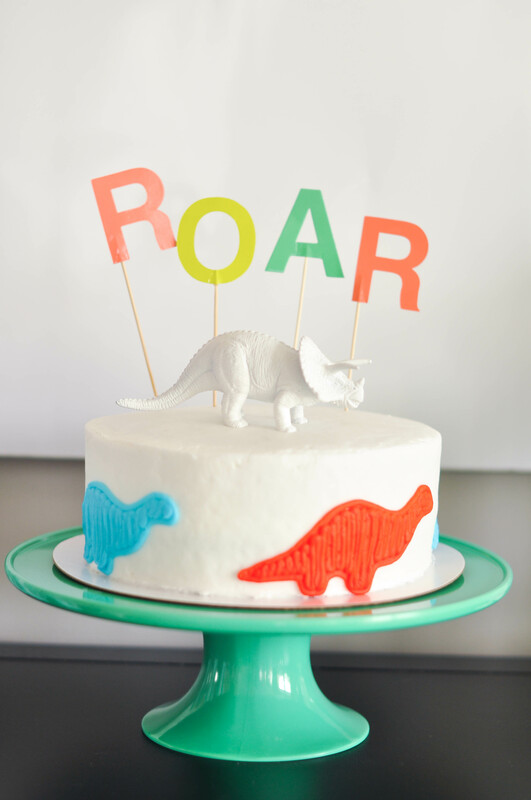 I topped it with ROAR (made out of Oh Joy for Target’s HOORAY topper) and a triceratops painted white. 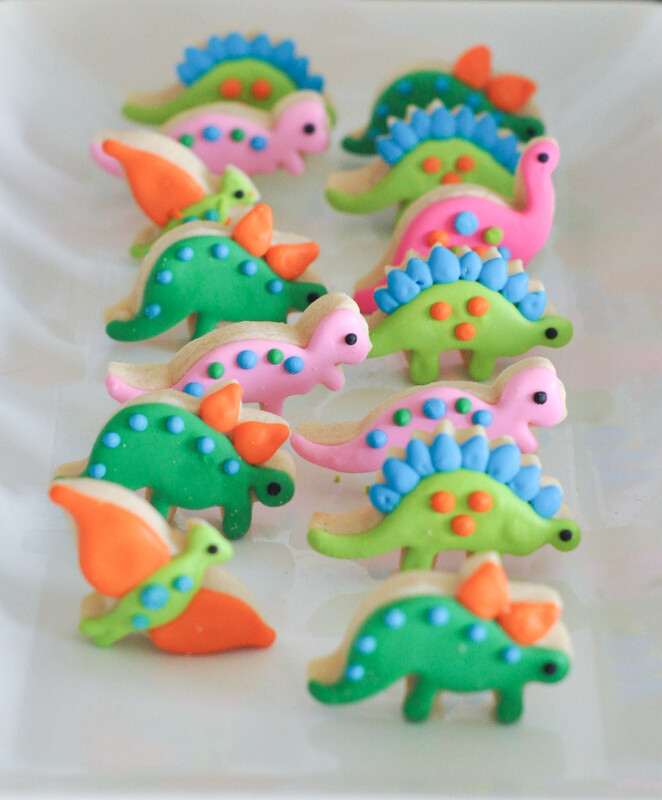 The one custom item I went for was a batch of cute little cookies from Etsy. 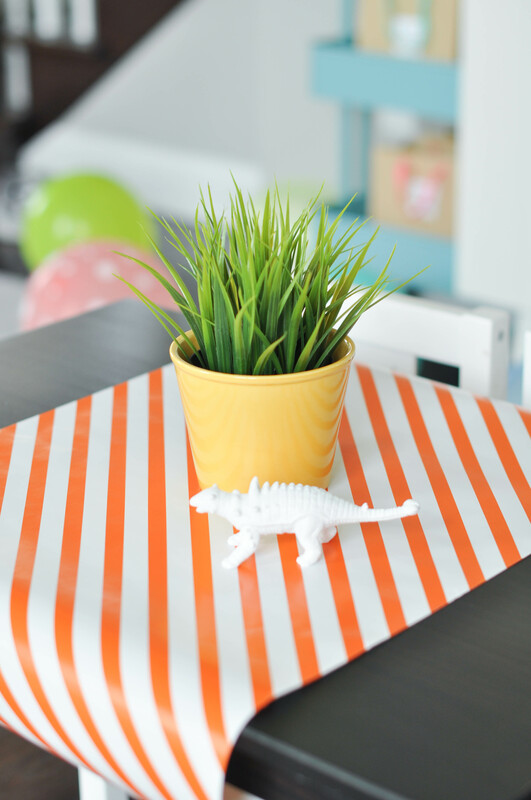 I painted many plastic dinosaurs solid white for decor and placed them throughout the party. After tossing a bunch of balloons on the floor for our New Year’s Eve kids party, I am now obsessed with balloons for kids parties. They are cheap and basic and take up a lot of space, but the best part is that kids just gravitate to them. They love them! Younger children go for the ones on the floor. Older children want the ones with strings. 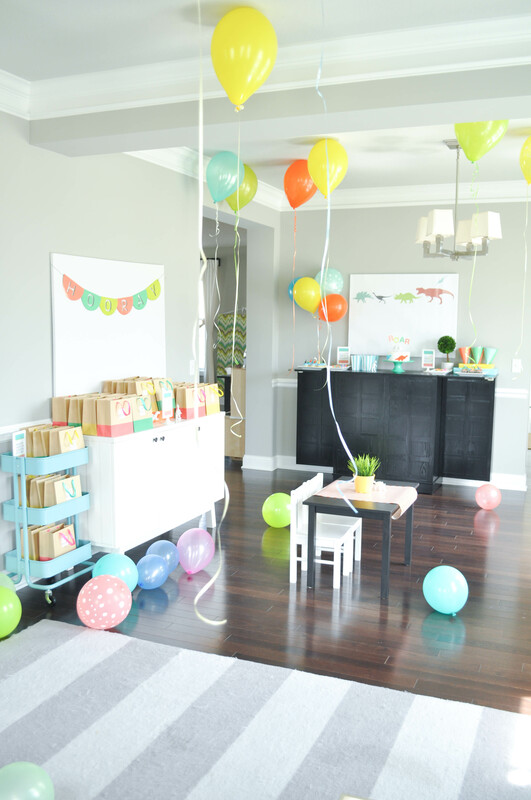 I threw balloons all over the floor and had 30-plus balloons inflated to cover our ceiling. 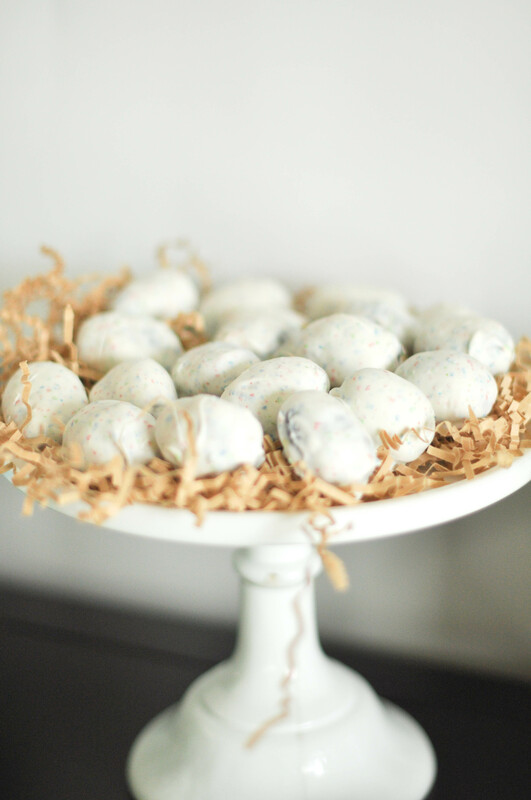 My friend made the dinosaur egg “cake pops” and had the clever idea of serving them in a nest. They were also the most delicious thing at the party. 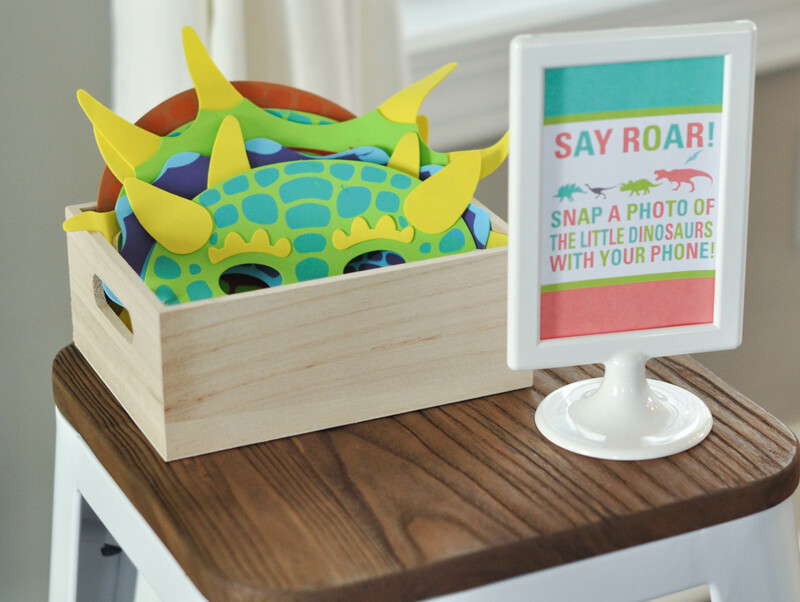 Activities included a dinosaur egg hunt, a photo booth, a bounce house, and more. I always put together these little photo booths for parties. 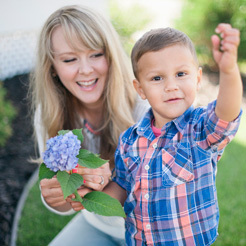 They are a simple way to get some cute photos of little ones and are a fun activity. Party favor bags were simple as well. 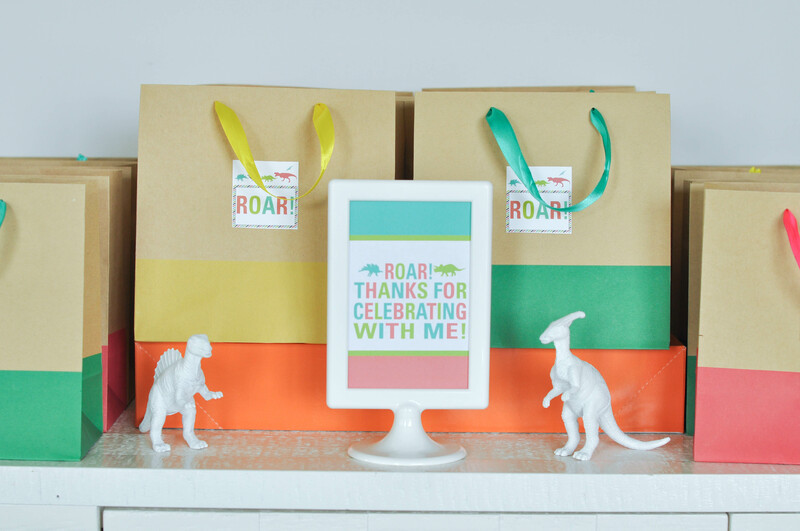 Our guests used the bags to gather all of their dinosaur eggs once we did the hunt. Our son had a really great day. And we think his friends did too. The best part is that I got to actually enjoy the day with my little birthday boy because I didn’t make it more complicated than it needed to be. 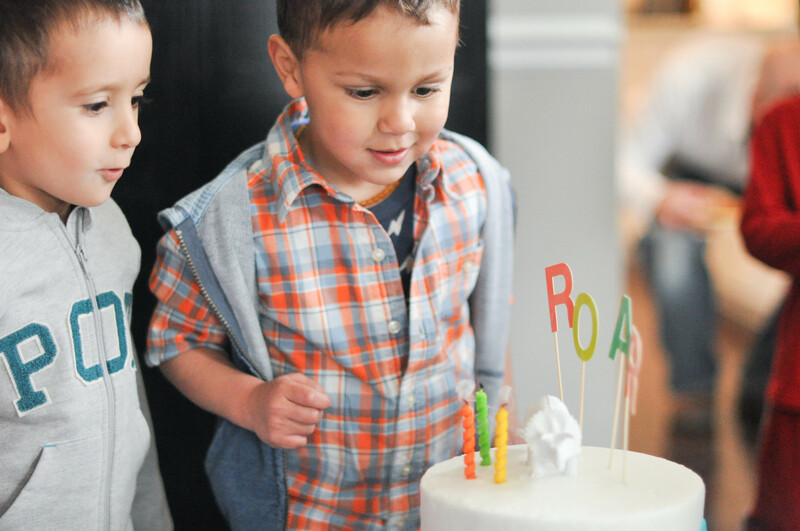 Birthday boy outfit: All the details are available on Oh Boy Style!